Forming squads, gearing up and taking down zombies. 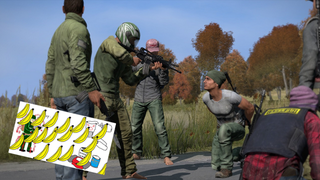 That's what DayZ is all about, right? Well, not entirely. Falling off ladders, dying from rotten bananas and being chased by zombies that can walk through walls, while trying to find players nearby? That's more like it! Here's an animated (and slightly NSFW) guide to DayZ from YouTuber Pyrion Flax that tells the truth.